JNN 03 Feb 2015 Damascus – At least six Shia pilgrims were martyred and 20 injured in a terrorist bombing on Sunday afternoon in central Damascus. 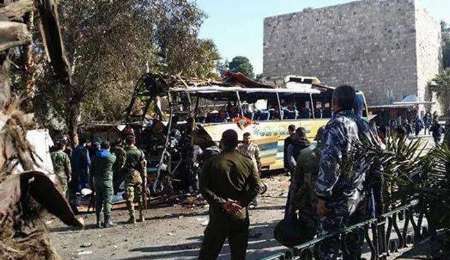 The deadly blast that happened on a bus in al-Kalasa district in the Syrian capital targeted Lebanese Shia pilgrims who were on their way to visit the holy shrines of Hazrat Zeynab (SA) and Hazrat Ruqayya (SA). The al-Qaeda-linked al-Nusra front has claimed responsibility for the attack, saying that it was carried out by a suicide bomber, al-Manar TV channel reported. Syria has been grappling with a deadly crisis since March 2011. The violence fuelled by Takfiri groups such as al-Nusra and the so-called Islamic State of Iraq and the Levant (ISIL) has so far claimed the lives of over 200,000 people, according to reports. New figures show that over 76,000 people, including thousands of children, lost their lives in Syria last year. The Lebanese resistance movement Hezbollah in a statement condemned Sunday’s terrorist bombing. Hezbollah considered the attack as an indication of terrorists’ barbarity and said that terrorist groups move in line with the objectives of the Zionist regime. This entry was posted in Middle East and tagged Bibi Ruqaiyah ', Damascus, Hazrat Ruqayya, Hazrat Zeynab, Holy Shrine of Bibi Zainab s.a, Islamic State of Iraq, Shia Pilgrims, Syria, terrorist bombing. Bookmark the permalink. WHAT ELSE COULD BE MORE REWARDING . MAY ALLAH GRANT THE MARTYRES A PLACE IN HIS JAWAR E REHMAT , PEACE , TRANQUILITY AND SABR TO THOSE WHO MOURN THEIR KITH AND KIN , LIKE THEY MOURN SHOHADA E KARBALA & THE FIRST MA’ASOOMAH MOURNER BIBI HAZRAT ZAINAB (s a a),MAIN FOUNDER OF AZADAARI . I AM AWAITING A PILGRIMMAGE , KINDLY PRAY WITH ME ATLEAST I GET A VISA SOME HOW TO VISITS THESE SACRED SHRINES , THEN WHATEVER HAPPENS IS MOST WELCOME .